Before long, the full scope of Sandpoint’s city services will be available with a few taps on a touch screen. City officials unveiled a new phone app Wednesday designed to make engagement with City Hall a simple and seamless process. 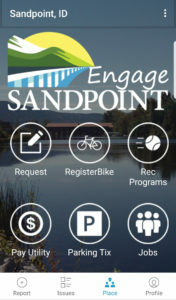 Dubbed “Engage Sandpoint,” the app can be used on everything from paying parking tickets or utility bills to reporting problems for city officials to address. According to Sandpoint Mayor Shelby Rognstad, the app distinguishes Sandpoint as a forward-thinking city in integrating new technology. “It’s kudos to our city staff about how willing they are to work with new technology,” Rognstad said. The app is built using the SeeClickFix framework, which was developed to give individuals an easy way to report problems to their city. Whether the issue is a pothole or a wayward moose, the SeeClickFix technology ensures that the reported problem is delivered to the appropriate department. Once an issue is reported, the official looking into it can post updates on any corrective action being taken. “This helps us determine what are the issues that really need to go to the top of the heap so we can resolve those first,” said Sandpoint City Administrator Jennifer Stapleton. The app utilizes a smartphone’s GPS capabilities to pinpoint the location of the problem, or the user can input a custom address. Users can also attach photos of the issue they’re reporting. After a simple registration process, app users can receive notifications once the city takes action on their report. However, individuals can still make reports if they wish to remain anonymous. City officials envision more functionality from Engage Sandpoint than problem reports. Eventually, the city will also be able to communicate to residents through notifications. That can come in handy if, for instance, traffic is impacted by an accident or city officials need to advise residents of a developing emergency. The ultimate goal is to integrate every aspect of city service into the app, and to that end, the city will be updating it on a regular basis to add new functionality. The notification system is one of the high-priority features to be rolled out later this month. “Our intention is all of our forms, functions and services … can be done at home from your mobile phone,” Stapleton said. That means residents can use the app to sign up for programs, pay utilities or parking tickets, access city geographic information system maps, inspect details of city finances or access surveys, notifications and newsletters. Eventually, business owners will even be able to renew their business licenses with a few minutes on their phone. Sandpoint is the only city in either Idaho or the Inland Northwest to roll out a public engagement app of this scope and scale, Rognstad said. “The way we’re implementing this app in Sandpoint goes far beyond what (SeeClickFix) was designed for,” said Stapleton. “Even among cities that have adopted SeeClickFix, I think we’ve really taken it to the next step in terms of adopting new functionality,” Rognstad added. The city has talked about introducing an app for about a year, Stapleton said, but it’s only in the past four months that it actively worked to establish the new system. It fit neatly into the priorities established by the Sandpoint City Council for the coming year, one of which is boosting citizen engagement. According to Stapleton, city employee Melissa Ward’s promotion to central systems manager was instrumental to getting the project moving. “She’s really been leading our way to get these systems launched,” Stapleton said. 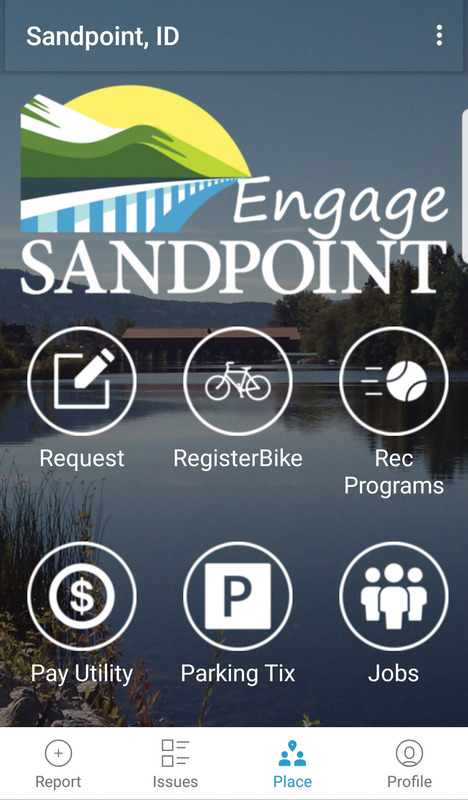 To download the app, Android users should search for “Engage Sandpoint” on the Google Play store. Apple users, meanwhile, should download SeeClickFix, then search for Sandpoint when the app asks for a city of residence. “We’re really excited to unleash this app today, and we hope you find it as powerful and rewarding as we hope it will be,” Rognstad said.